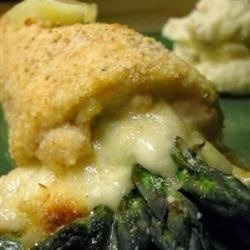 Very flavorful chicken and asparagus dish with almost a hollandaise-inspired flavor with a little crunch from the Panko breadcrumbs. Quick and easy to prepare, the presentation is simple yet elegant. Great served with artichokes! Preheat oven to 475 degrees F (245 degrees C). Grease a baking dish. In a bowl, mix together the mayonnaise, Dijon mustard, lemon juice, lemon zest, tarragon, salt, and pepper until the mixture is well combined. Set aside. Cook asparagus in the microwave on High until bright green and just tender, 1 to 1 1/2 minutes. Set the asparagus spears aside. Place a chicken breast between two sheets of heavy plastic (resealable freezer bags work well) on a solid, level surface. Firmly pound the chicken breast with the smooth side of a meat mallet to a thickness of about 1/4 inch. Repeat with the rest of the chicken breasts. Place 1 slice of provolone on each chicken breast, and top the cheese with 4 asparagus spears per breast. Roll the chicken breasts around the asparagus and cheese, making a tidy package, and place, seam sides down, in the prepared baking dish. With a pastry brush, apply a coating of the mayonnaise mixture to each chicken breast, and sprinkle each with panko crumbs, pressing the crumbs into the chicken to make a coating. Bake in the preheated oven until the crumbs are browned and the chicken juices run clear, about 25 minutes.